Each year, The Ronald McDonald House Charities of Southern and Central Alberta hosts the Rock the House Run – a 10km run, a 5km run and walk, a 1km walk for kids, and a post run Family Festival in the community of Varsity at Market Mall. The event needs to keep their race participants hydrated and celebrating their achievement without negatively impacting the community through which they race. Green Event Services were brought on for waste reduction consultation, and subsequent infrastructure and staff. 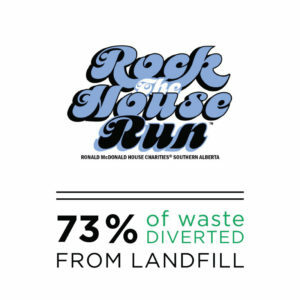 By ensuring the use of compostable disposables along the race route, we were able to ensure greater waste diversion right away – this way, what is collected requires less people power to sort through it.